Maggi does not need any introduction and every has a childhood memory attached to it. 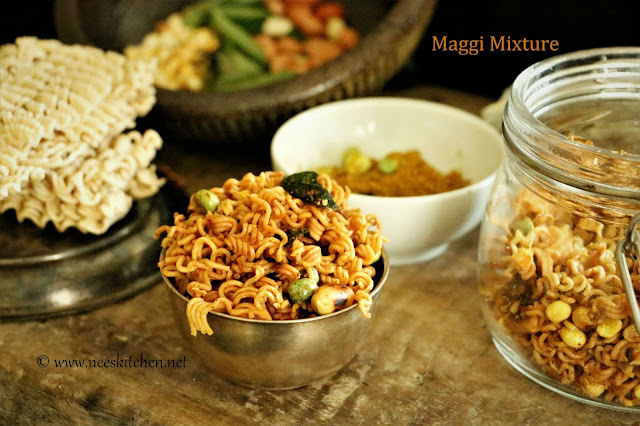 Today’s dish is “Maggi Mixture” which is a simple variation from the regular soupy noodles way of cooking. At time when we are craving for snack, Maggi mixture comes handy. The ingredients which I have used are perfect for kids. However for adults I would recommend to use chili powder & a pinch of salt. Feel free to mix and match with cashew nuts. I would rather suggest to bake in oven rather than deep frying the maggi in oil. I had used ghee rather oil in the video. Olive oil can be used in place of ghee. 1. 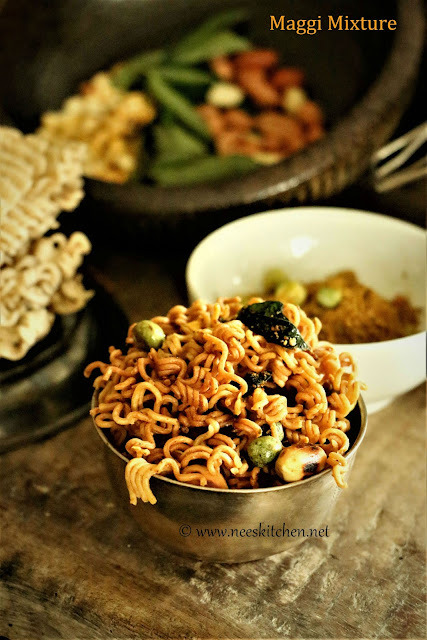 Empty the noodles packet and keep the taste maker sachet aside. 2. Take an oven safe pan and brush with 1 spoon ghee. Preferably wrap the oven safe pan with an aluminum foil so that it is easy to take the final baked noodles. 3. Crush the noodles into smaller pieces. 4. Add ½ tsp ghee and mix it well with the crushed noodles. Spread the noodles across the pan. 5. Pre-heat oven at 180 degrees Celsius. This would approximately take 5 minutes. 6. Place the oven safe pan which has the noodles into the oven. 7. Let this get baked. It would take 10 minutes (approximately). You would start getting a nice aroma. 8. In parallel, we can start preparing the remaining ingredients. Start with dry roasting of peanuts. Once it is cool, remove the skin and keep it aside. 9. Slightly dry roast the roasted gram in very low flame. Be cautious while roasting this as it would turn black very fast. 10. The noodles would be baked by this time in the oven. Take them out (Approximately 10 minutes) and place them in a bowl. 11. 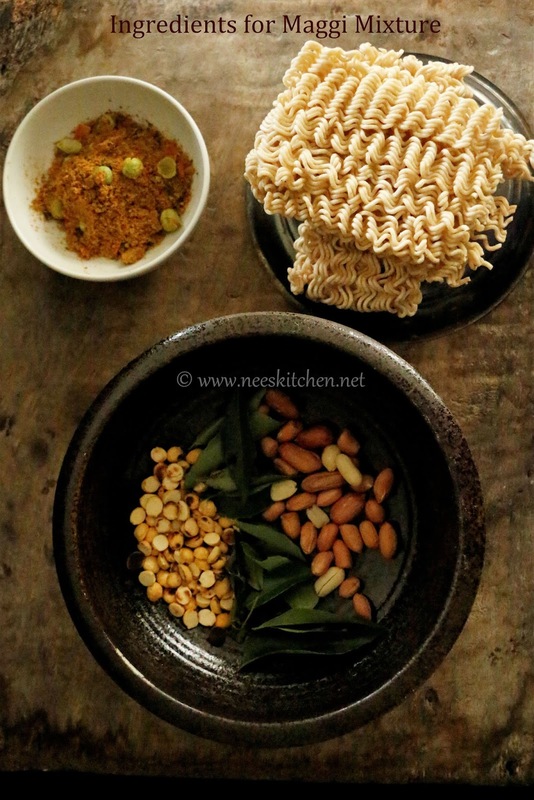 Add peanuts & roasted gram to the baked noodles and mix them with a dry spoon. 12. Take a frying pan and start the tempering. Add remaining ghee (2 ½ tsp) and curry leaves first. 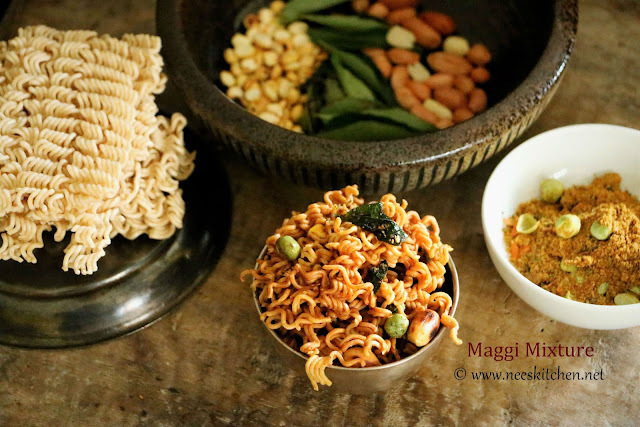 Once the curry leaves turn crisp, add the Maggie taste maker mix. Make sure the small vegetables inside the taste maker are cooked which roasting them in ghee. 13. Transfer it to the noodles mix. 14. Mix well with a dry spoon. Allow it to cool a bit before it is stored in an airtight jar.